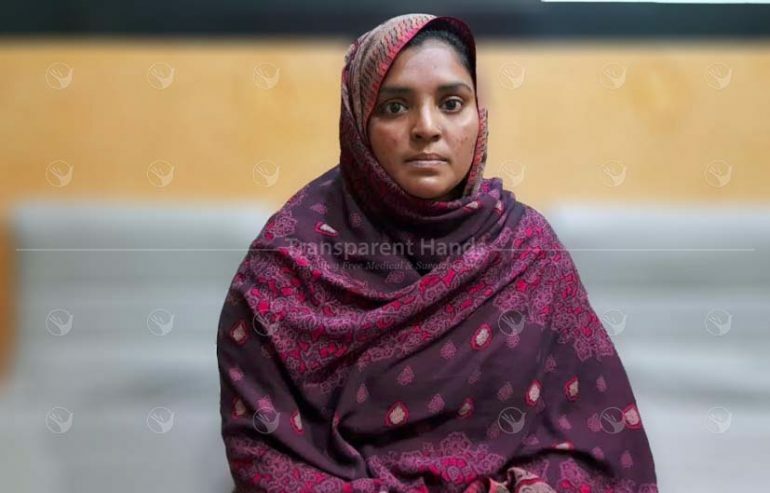 Asma Bibi is a 33 years old homemaker who was diagnosed with Gall Bladder Stones. Due to her disease, she experiences painful symptoms like nausea, vomiting, burping and aches in her right hypochondrial area. She has trouble with her digestion and suffers from abdominal pain very often. Her condition has worsened so much that she is unable to do her household chores. She was married to Mohammad Ajmal about 17 years ago. Her husband is a laborer, earning only 9000 PKR per month. Ajmal carries luggage for people on office roofs and works really hard to fulfill all the basic necessities of his family. Asma and Ajmal are blessed with 4 daughters and 3 sons and the whole family lives in a small house granted by their parents. Despite their financial hurdles, they are managing to give education to their children as they want them to become something when they grow up. Asma’s family is currently going through a tough time due to her health. She is bed ridden most of the times and her condition is affecting her mental health as well. Someone from their neighbors told them about Transparent Hands and they immediately contacted us for her surgery. She is now scheduled for her surgery in a few days at Abid Hospital, Mian Channu. She needs your kind support in her surgery. Donate for her surgery now! Be the first one to support Asma bibi.